An isthmus ( or ; plural: isthmuses; from Ancient Greek: ἰσθμός isthmos "neck") is a narrow piece of land connecting two larger areas across an expanse of water that otherwise separates them. 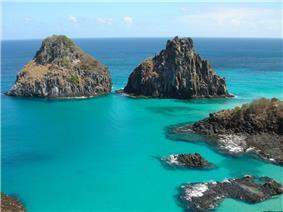 A tombolo is an isthmus that consists of a spit or bar. Canals are often built across isthmuses, where they may be a particularly advantageous short cut for marine transport. 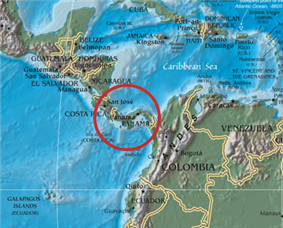 The Panama Canal crosses the Isthmus of Panama, connecting the North Atlantic and Pacific Oceans; the Suez Canal connects the Mediterranean Sea and the Indian Ocean, cutting across the western side of an isthmus formed by the Sinai Peninsula. An example in the United Kingdom is the Crinan Canal, which crosses the isthmus between Loch Crinan and Loch Gilp, which connects the Kintyre peninsula with the rest of Scotland. A strait is the sea counterpart of isthmus. Isthmus of Mansheya which developed around the man-made Heptastadion connecting the island of Pharos to mainland Alexandria. The Caucasus region connecting Europe to Asia between the Black Sea and Caspian Sea is sometimes considered an isthmus. The Isthmus of Kra connecting Malay Peninsula with the mainland of Asia located in southern Thailand. The Sinai Peninsula forms the Isthmus of Suez between the Mediterranean Sea and Red Sea and also forms the Asian border area towards Africa. The central area of Kushimoto town in the Wakayama prefecture of Japan is located on a narrow isthmus, surrounded on both sides by the Pacific Ocean. 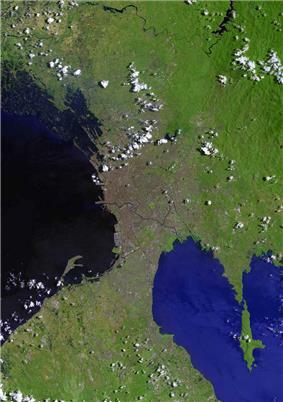 Metro Manila in the Philippines is situated on an isthmus. The area around Jimbaran and the Denpasar airport connects the Nusa Dua peninsula with the main part of Bali in Indonesia. isthmus of Ierapetra, connects the north coast to south coast of the island and is the narrowest part of Crete. Tarbert is the name of several places at isthmuses in Scotland and Ireland. The translation from Old Irish is isthmus or portage-place ("across carry"). Barrenjoey Headland, New South Wales.